Back in November, 2010, Julie told us about the Bolle BP-10 Photo Printer. At the time, the printer was available as a pre-order from a European company. 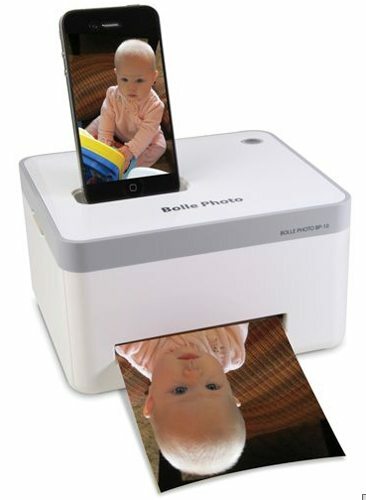 Now, the Bolle is available as the iPhone Photo Printer from Hammacher Schlemmer. It produces photo-quality prints directly from a docked iPhone or iPod touch. Simply donwload a free app to control the iOS device, and you’ll be printing one, four, or ten images on a single 4X6 inch piece of photo paper. The printer needs no cartridges; the special paper is embedded with yellow, magenta, and cyan dye crystals. The printed photos are smudge, tear, fade, and water resistant. If you supply the appropriate cable, you can also print from an Android phone, iPad, and iPad 2. The iPhone Photo Printer will begin shipping 5/20/11. The printer is $159.95; replacement paper packs are $24.95.